(CBSNews) Grandma's got the beat! On a regular day at Coalition Drum Shop in La Crosse, Wisc., this white-haired lady -- later referred to as "Mary, the Grandma Drummer" -- comes in and takes a seat at a drum set. And I don't think anyone expected what was coming! 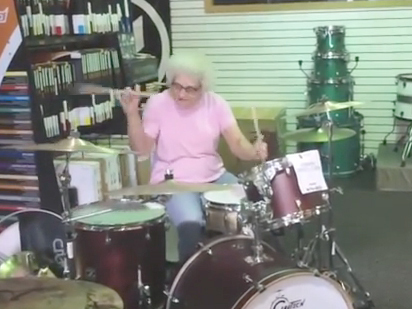 Check out the video posted on the drum shop's YouTube page to see the mad skills this granny has. Not only does she have rhythm and speed, but she's got some tricks up her sleeve, too. She owns those sticks -- twirling them first with one and then both hands simultaneously. The video went viral on Friday, and has since attracted lots of attention. Mary has even been tracked down by local news stations. Turns out, she started drumming at the age of 15 and played in bands up until 1990. When her last band broke up, she sold her drums -- hence the need to bang the skins whenever and wherever she can. Something tells me she may be getting a new pair of drums sometime soon. Oh, and she's not a grandma, she's in fact never had children. Meh, details, details, rockin' granny just sounds so good.